"I'm not here for platitdes, "Dee"...you been briefed on this malarky?" National Security Advisor under President Daria Morgendorffer, 2021-2029. A former RAND advisor—where she would help write several Single Intigrated Operational Plans for the Pentagon—she was known for a somewhat ascerbic attitude, a knack for coming up with nicknames, and a slight case of strabismus. Her secret service codename was "SAWBONES"—a nod to her father, Dr. Paul Eulmeyer, co-creator of the hydrogen bomb...and a lesser known osteosolvant weapon system. 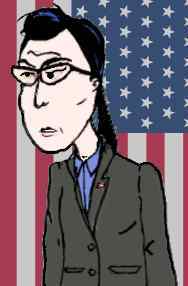 Behind the Scenes: Ms. Eulmeyer may "somehow" be related to the character Eunice Eulmeyer who appeared in the shortlived animated series "Mission Hill," voiced by Jennifer Jason Leigh. This page was last edited on 6 June 2007, at 08:51.